The rope magic trick is a really easy magic trick to do. 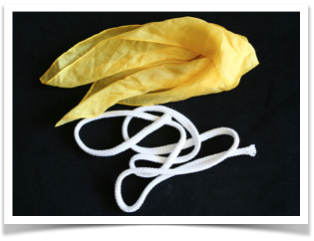 You will make a silk hanky pass straight through a piece of rope or string, right in front of your audiences’ eyes. The magic effect is called a ‘penetration’. In the tope magic trick, we start with the rope. Fold the length of rope in half. Hold the rope as shown in the picture. 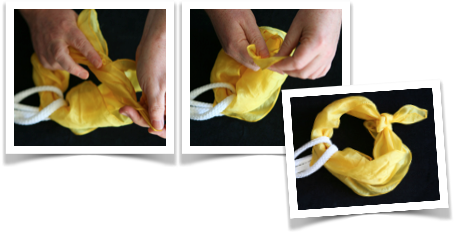 Now fold the loop back over the rope like in the picture. Pick the rope up by pinching the two pieces together (in the red circle). This creates a loop like in the picture on the far right. 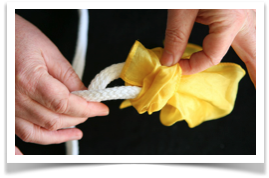 Pass the hanky through the loop and pull the rope tight onto the silk. It looks like you have now tied the rope onto the silk. Now tie the ends of the silk together with a double knot. It appears that you have now tied the silk onto the rope. 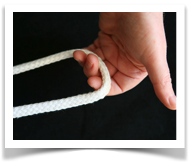 Grab hold of a piece of rope in each hand and pull the rope apart (like in the pictures). Now it is time for the magic. 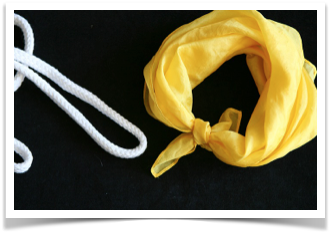 Grab hold of the hanky (like show in the picture) and give it a tug. You have just made a silk pass through a solid piece of rope with this amazing rope magic trick. 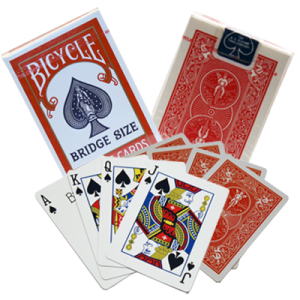 And best of all, it is self working so you can do magic!